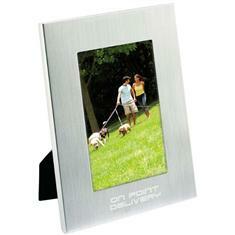 A budget friendly brushed aluminum frame makes a great gift. Built in easel back for easy display of a favorite 4" x 6" snapshot. Logoed items on the desktop create a favorable impression to the recipient! Imprint Area: 3-1/2" x 15/16"